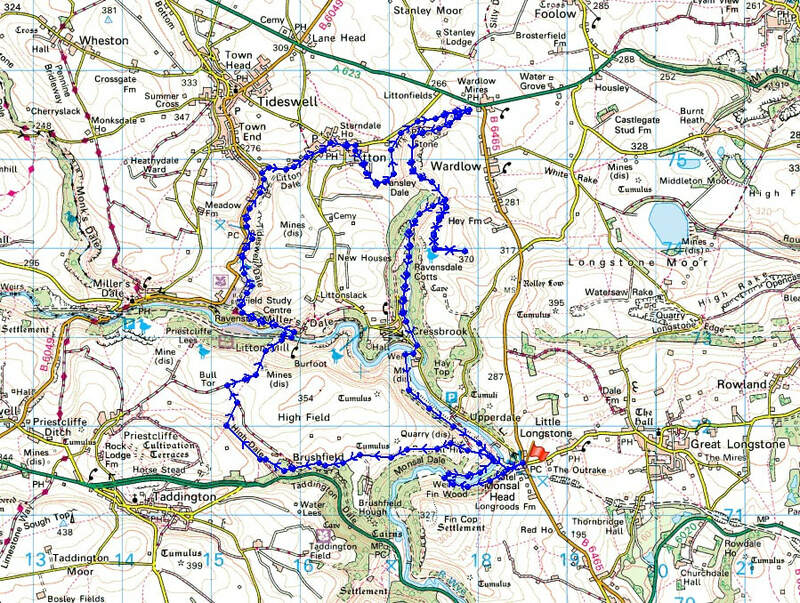 I decided to have a walk in the Peak District today after working out this route from Monsal Head. 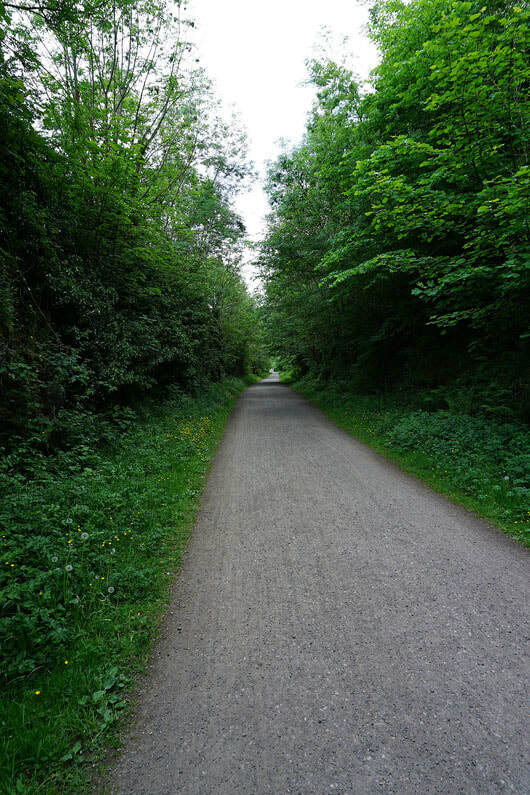 I've started from there several times now so what I came up with was just a variation of what I've done before. 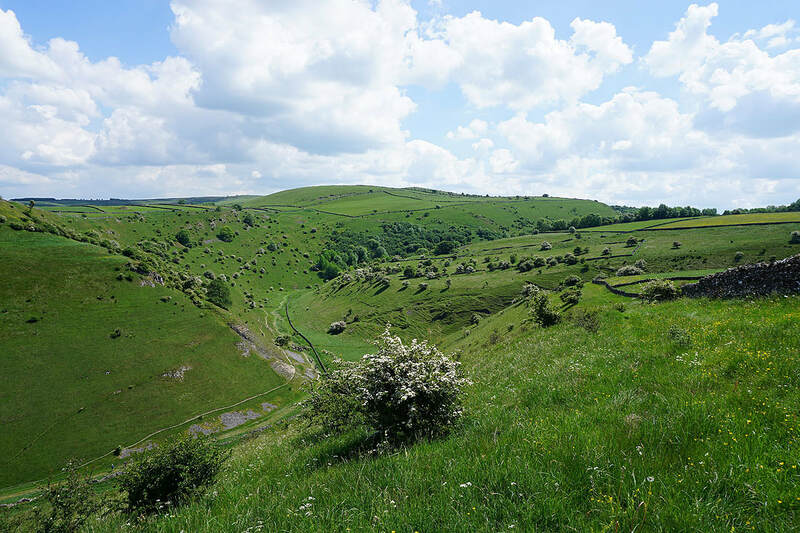 I did have to include Cressbrook Dale, one of my favourite White Peak dales, and the top of Wardlow Hay Cop, so that I could take in the view from it. 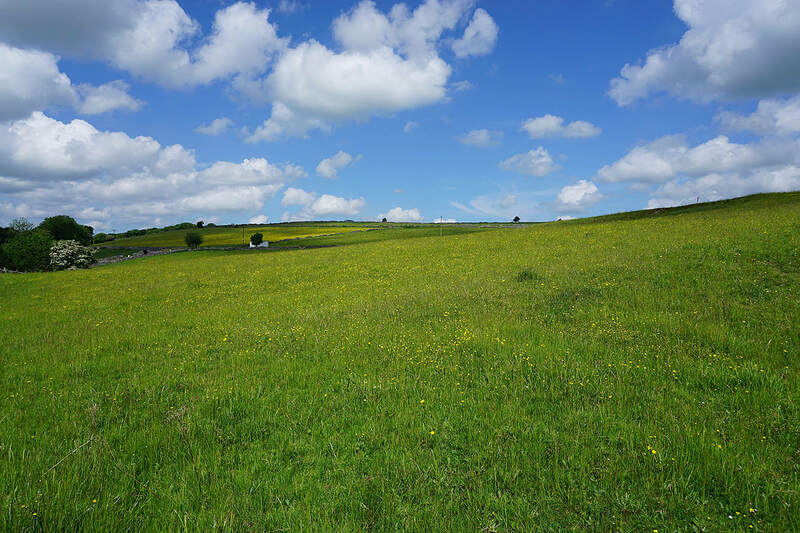 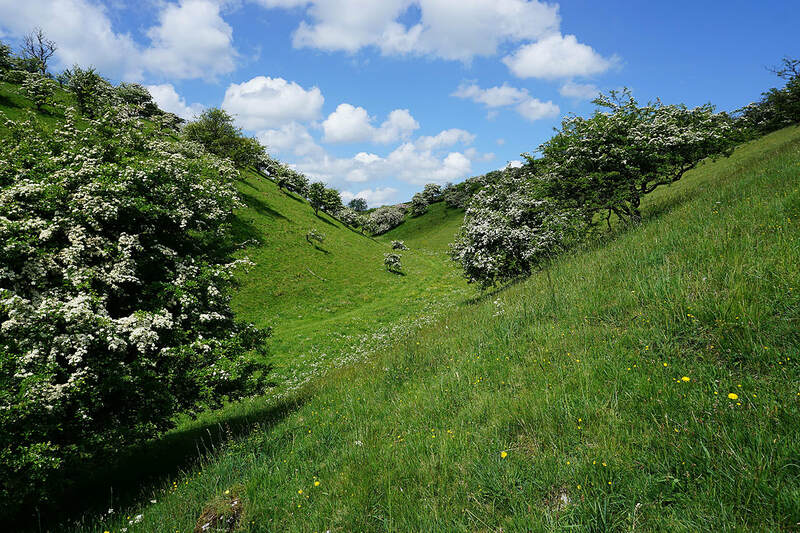 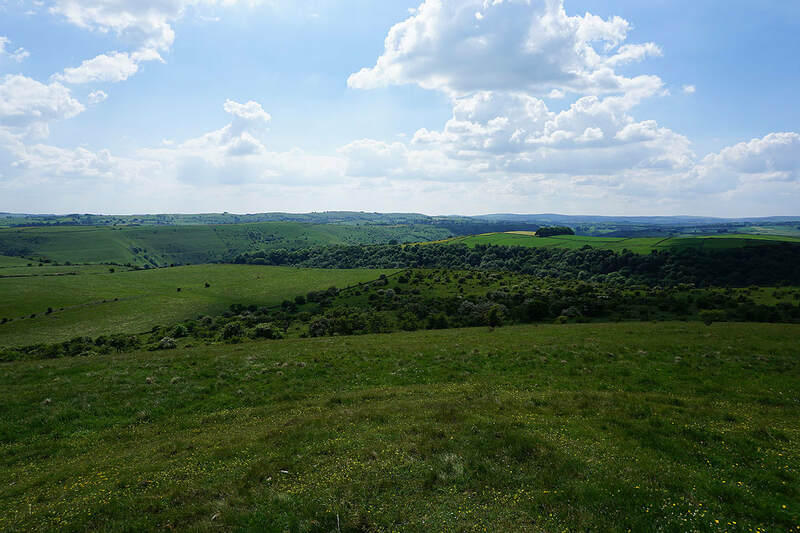 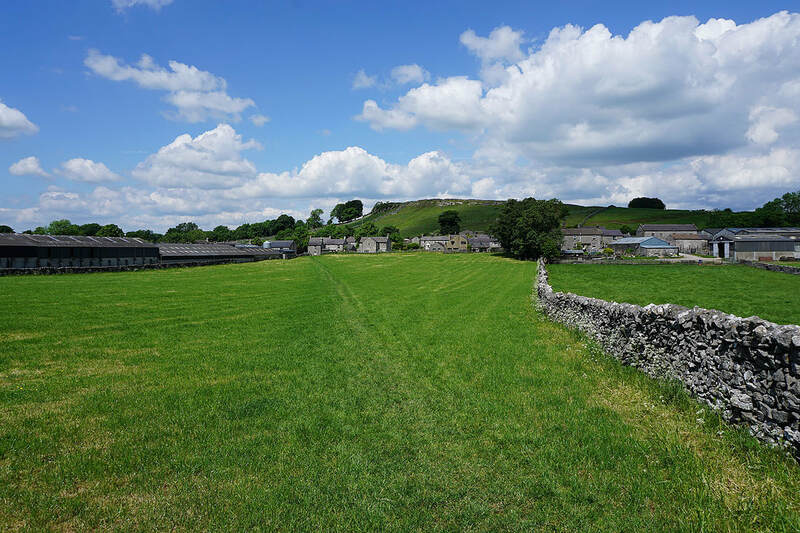 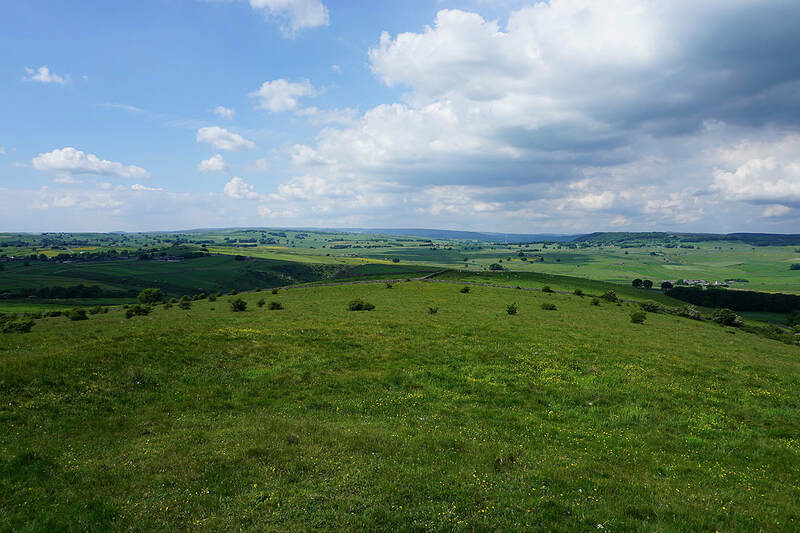 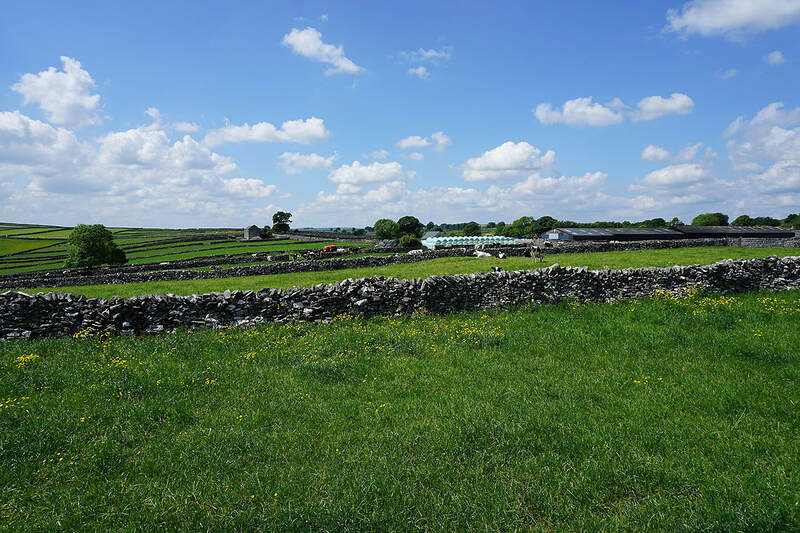 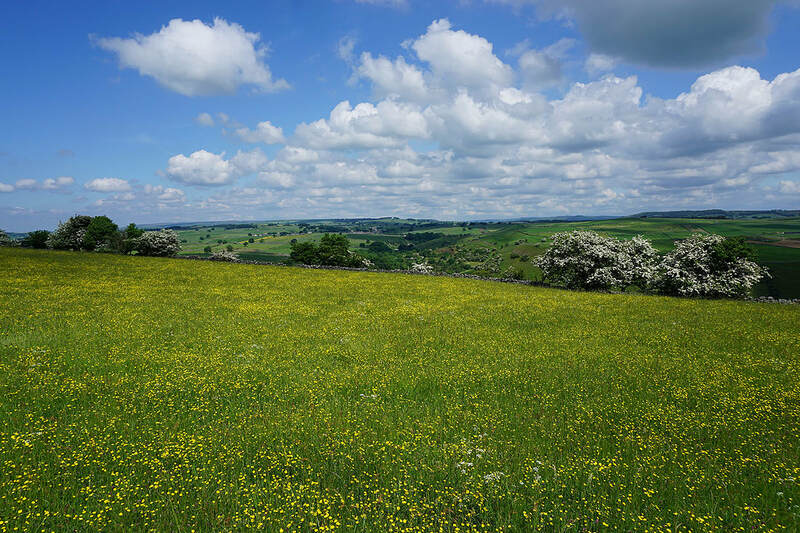 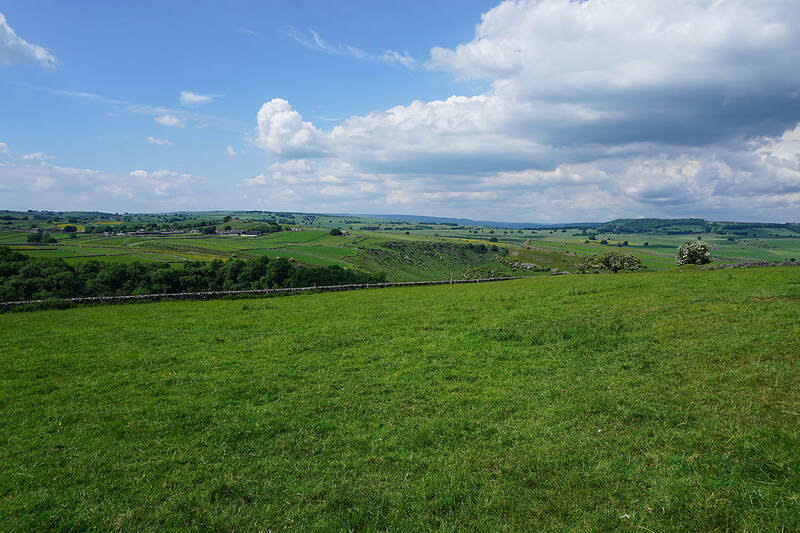 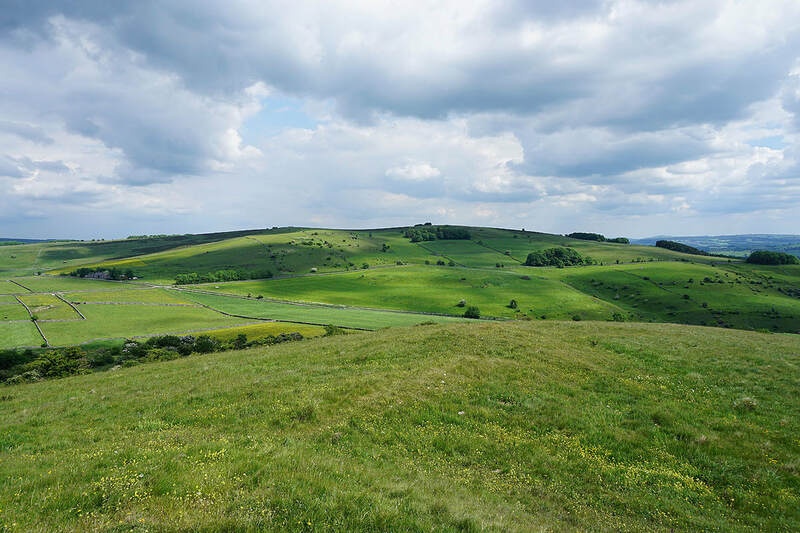 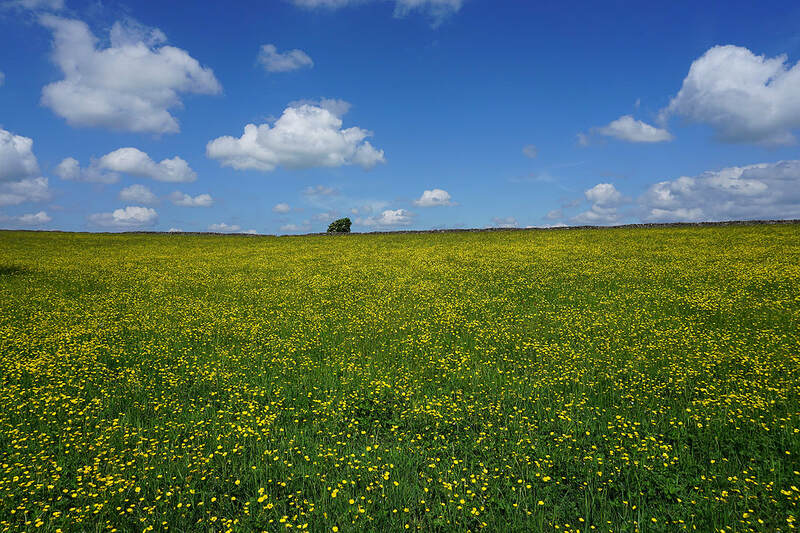 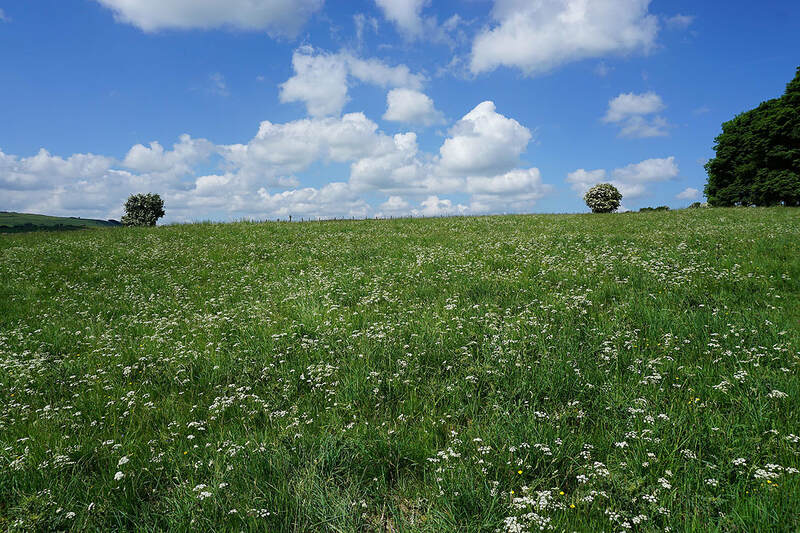 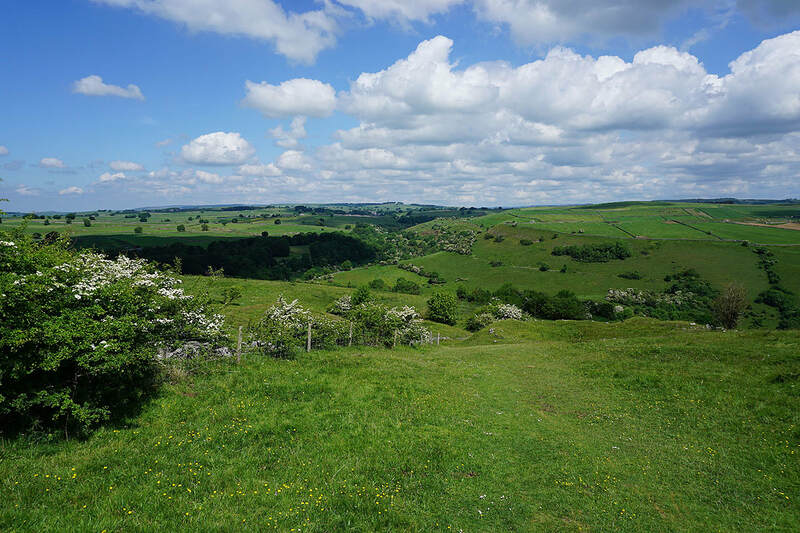 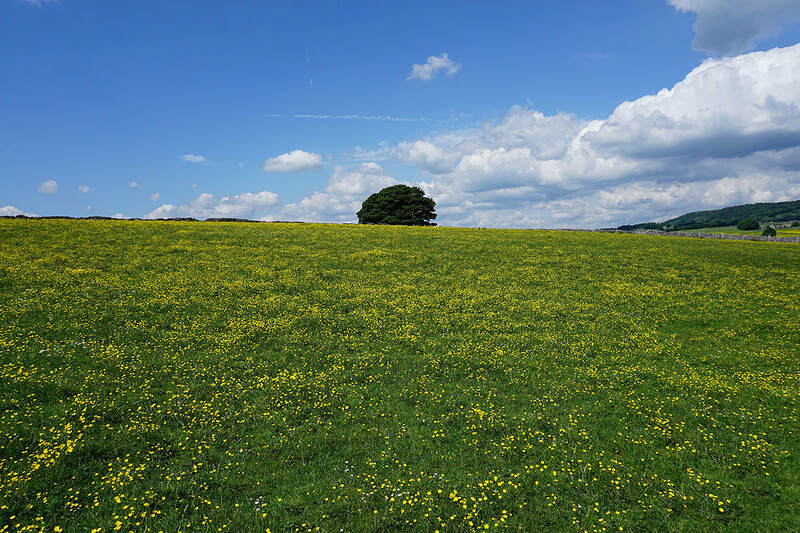 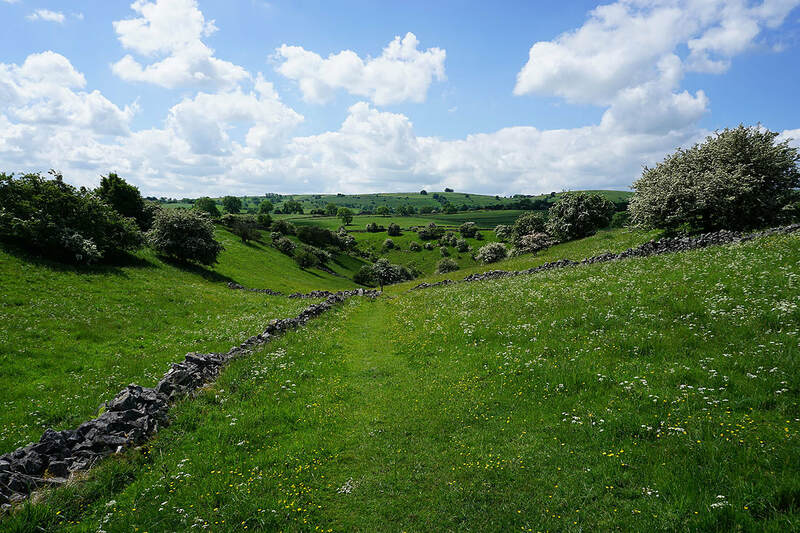 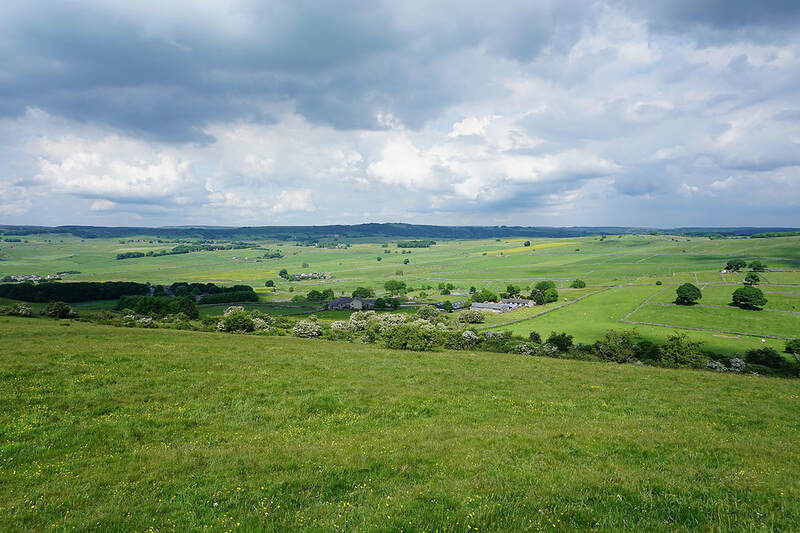 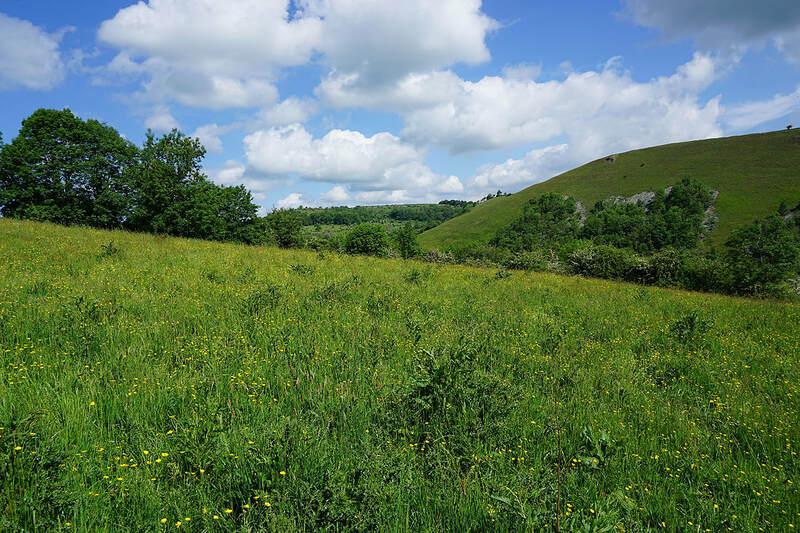 It was a beautiful early summer's day, lots of warm sunshine and a gentle breeze, perfect for taking in the buttercup filled fields, the hawthorn in flower and great views across the White Peak. 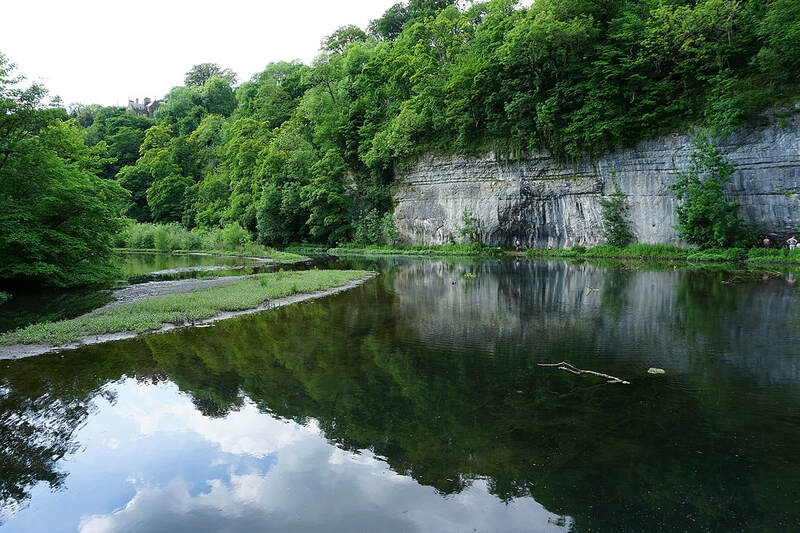 From the car park at Monsal Head I took the footpath down into Monsal Dale and past the weir on the River Wye to cross the footbridge over the river. 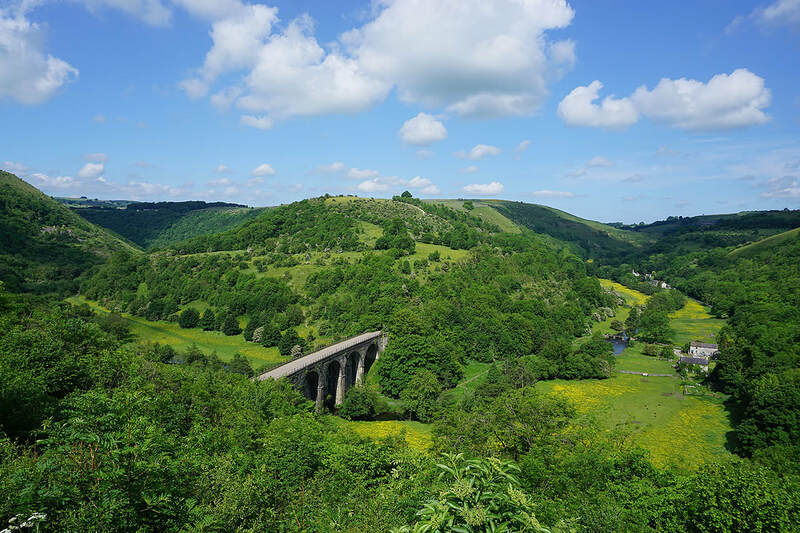 I then walked back up the valley to the viaduct where I climbed up to reach the Monsal Trail that runs across it. 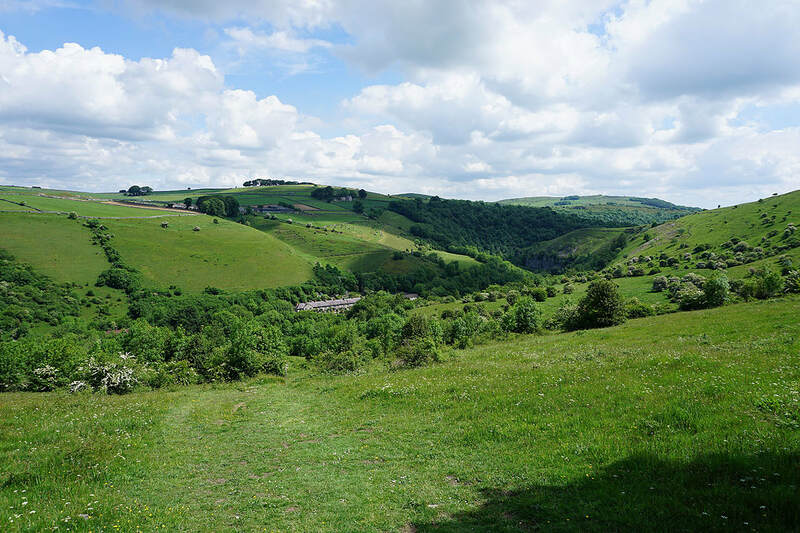 I soon left it though for the byway that heads west above Monsal Dale to reach Brushfield. 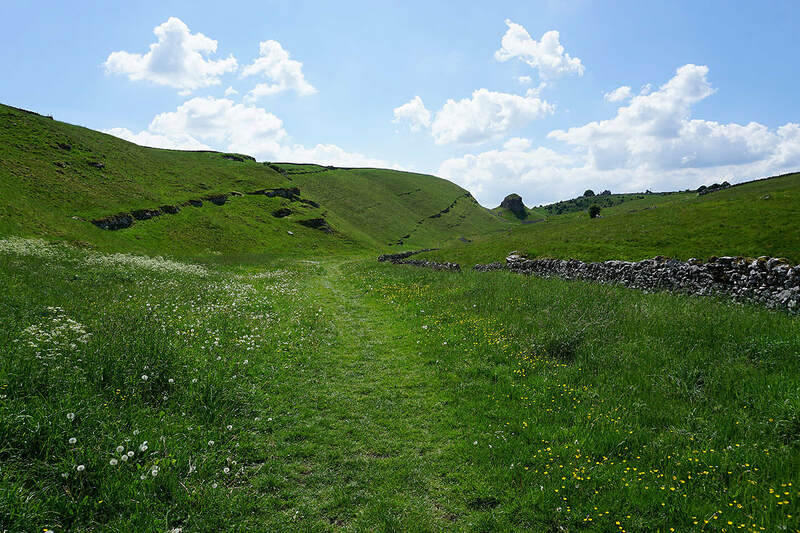 After a brief walk down the road towards Taddington Dale I took the footpath up High Dale. 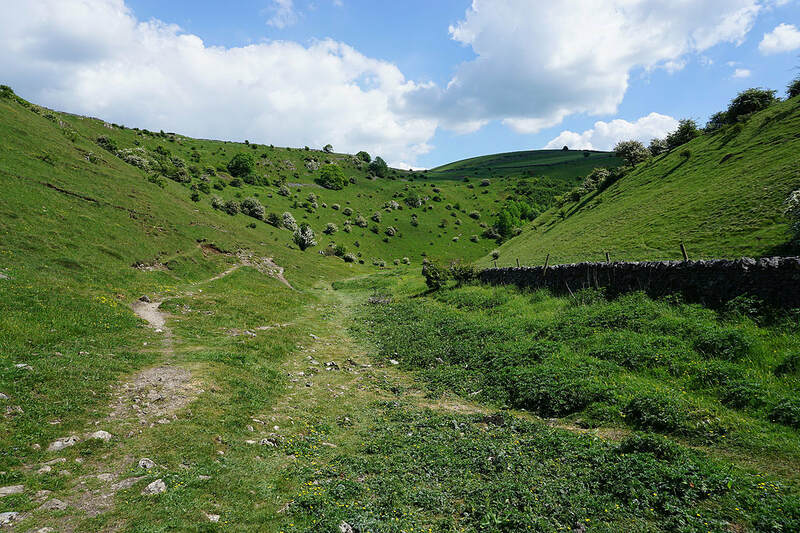 When the dale turned to the left I took a footpath up a side valley on the right to reach a byway on the hillside above. 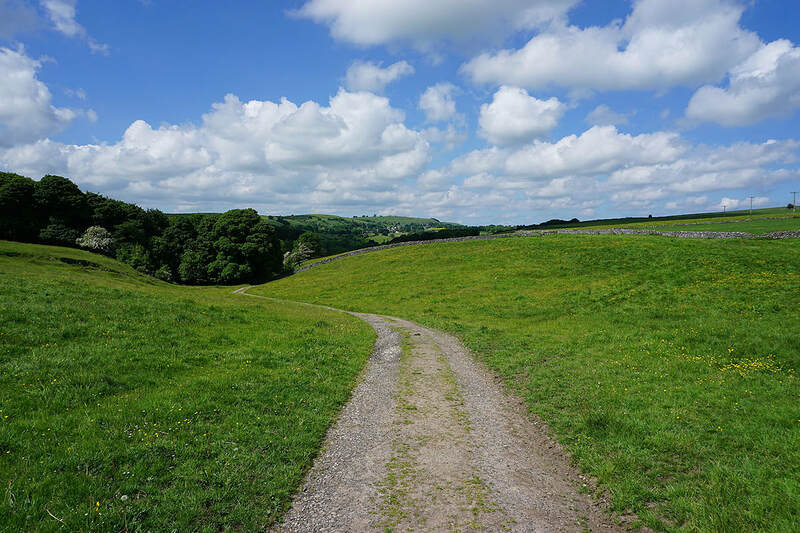 I followed this north and when it turned to the left I took the footpath up and over the hill and down to Litton Mill. 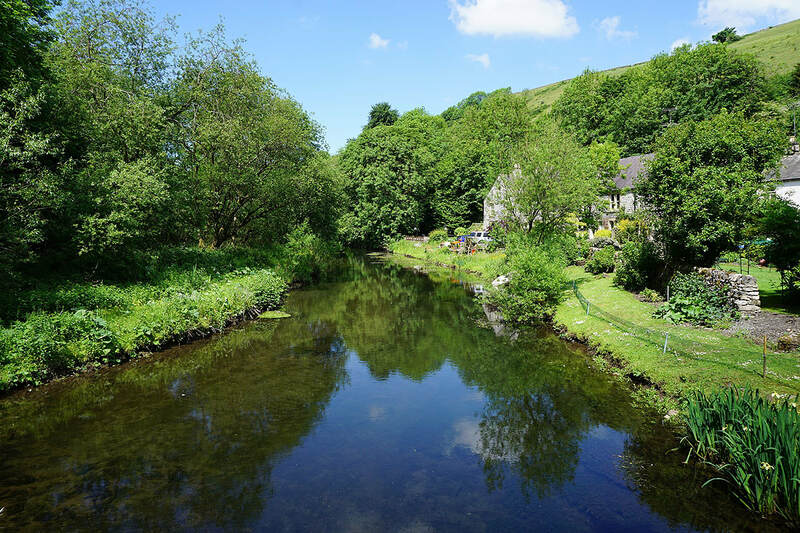 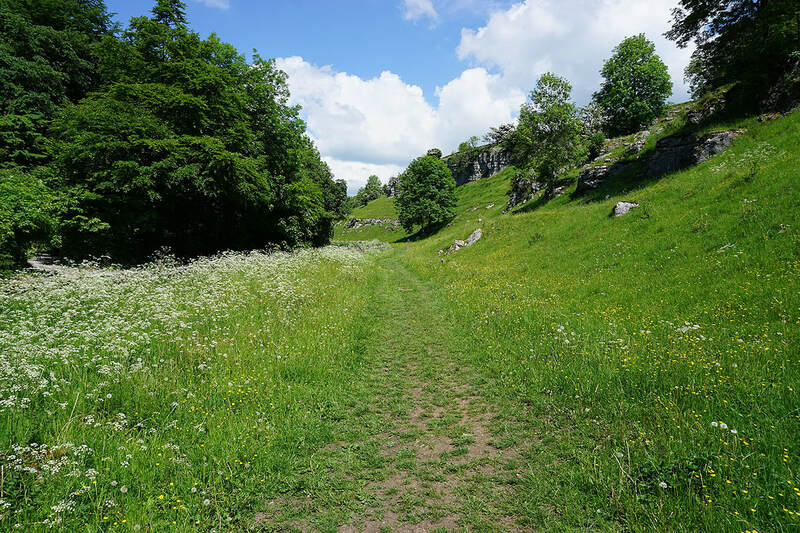 I crossed the River Wye then walked west along the road from Litton Mill to reach the footpath up Tideswell Dale. 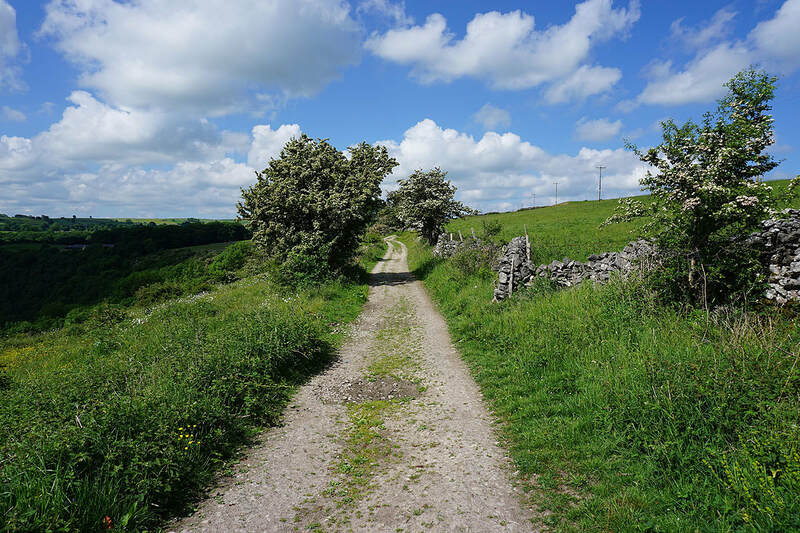 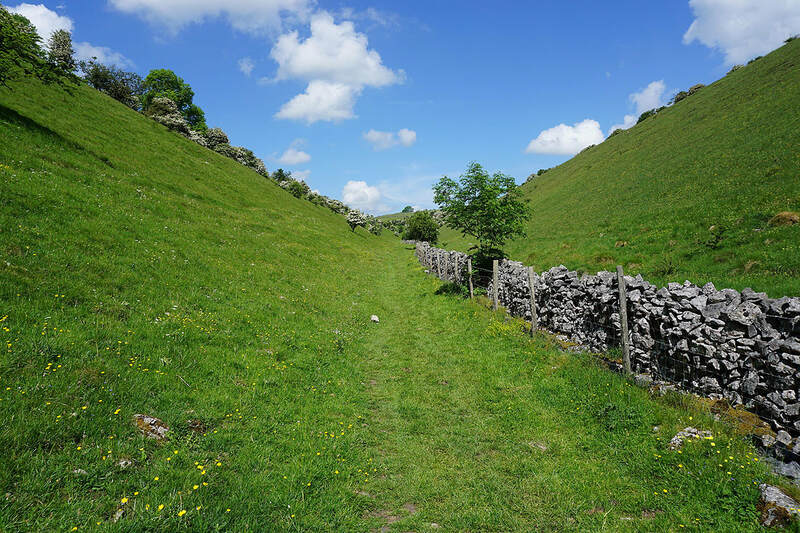 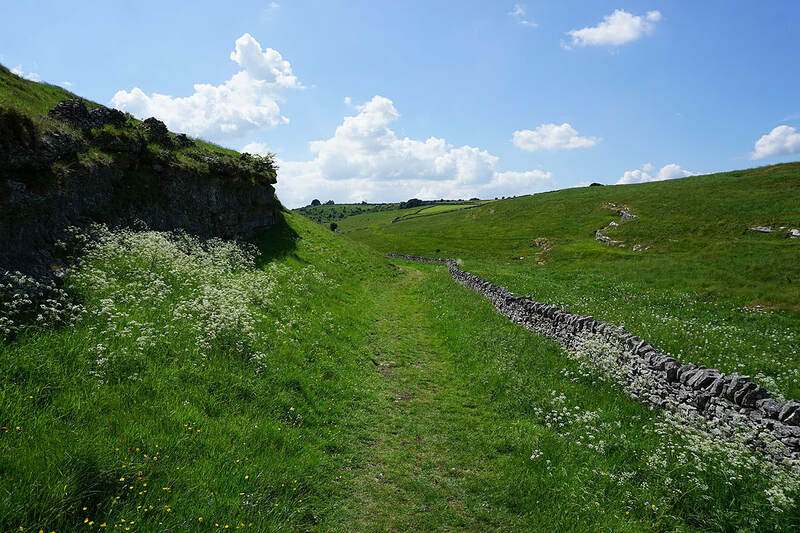 This footpath took me up the dale past the car park and picnic site to the road to Litton. 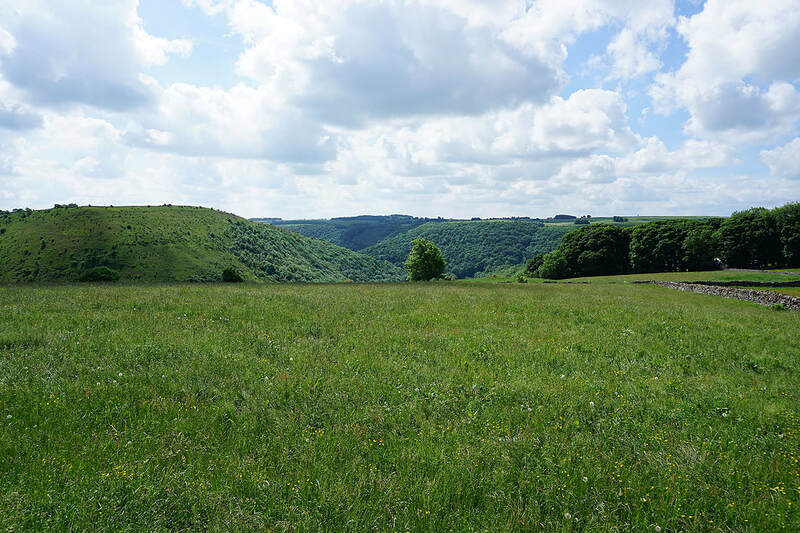 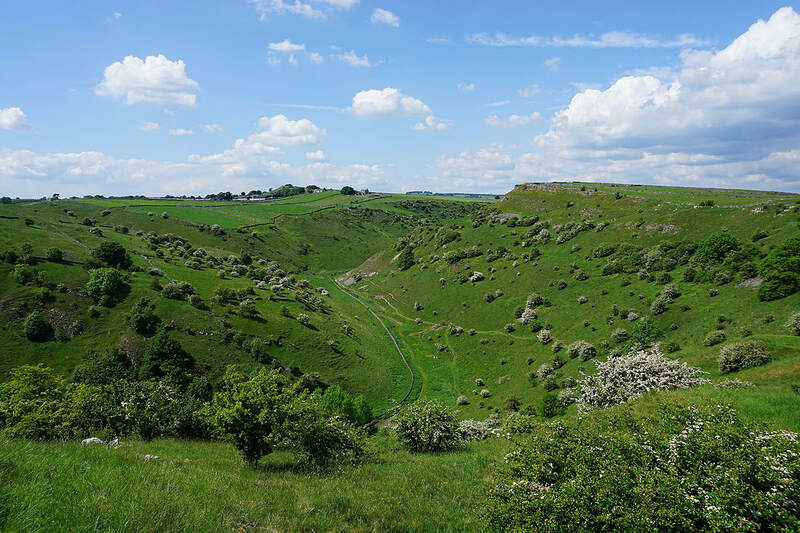 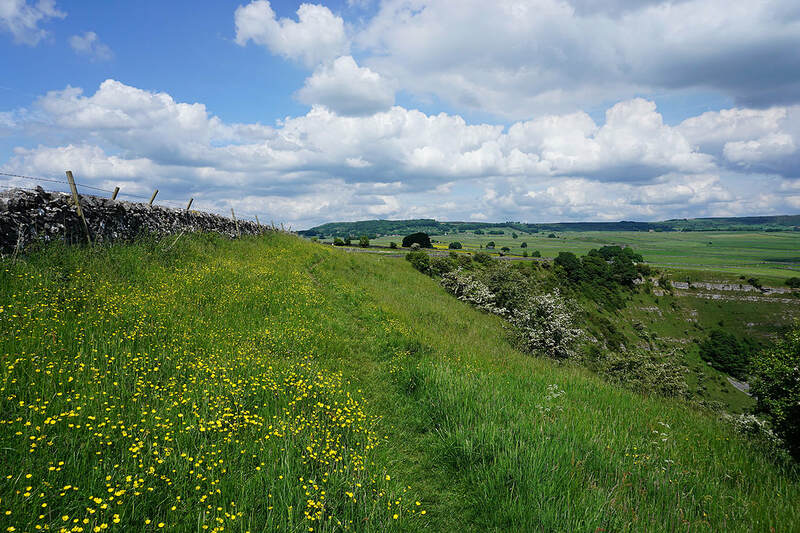 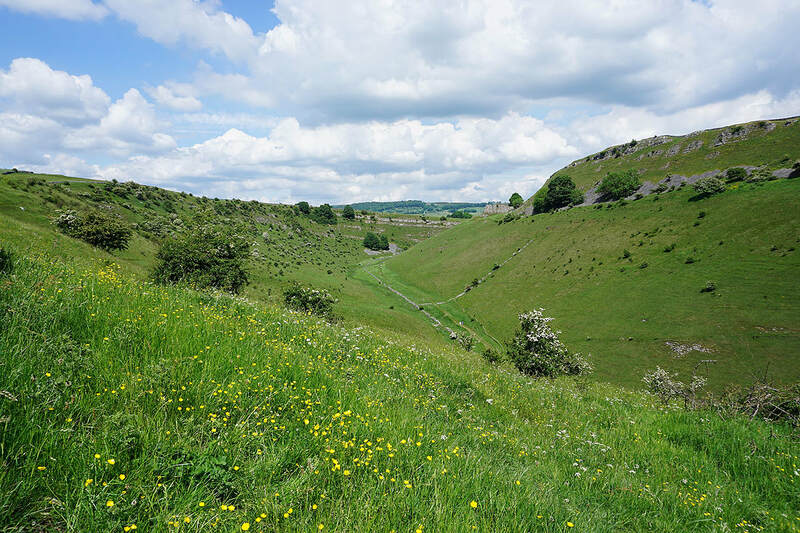 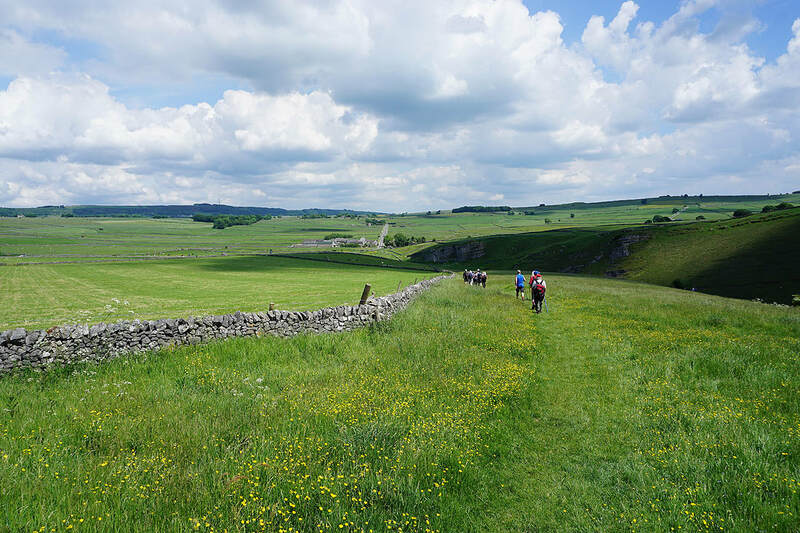 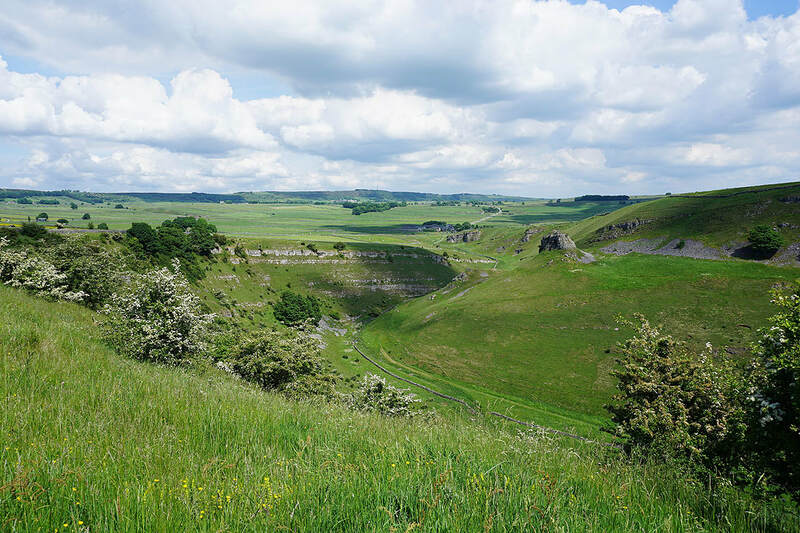 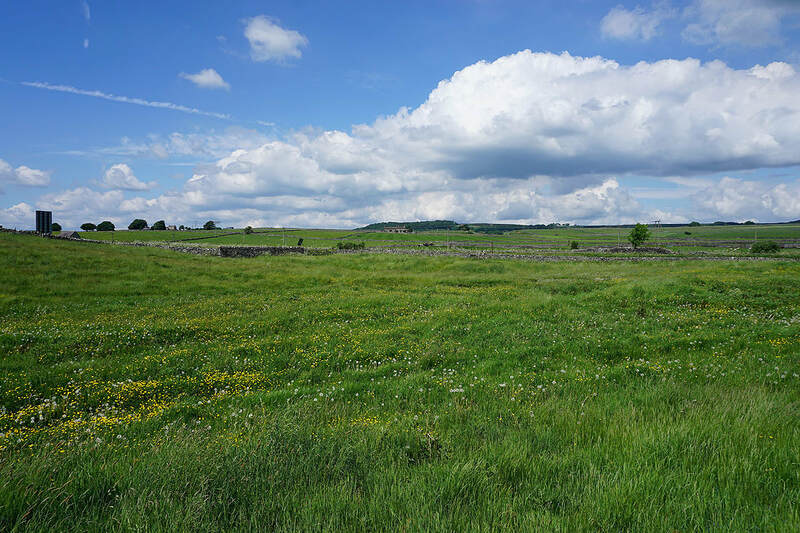 After a break for coffee and cake in Litton I then took the footpath south across fields to Tansley Dale, where I kept to the top of access land, and as I made my way north up Cressbrook Dale. 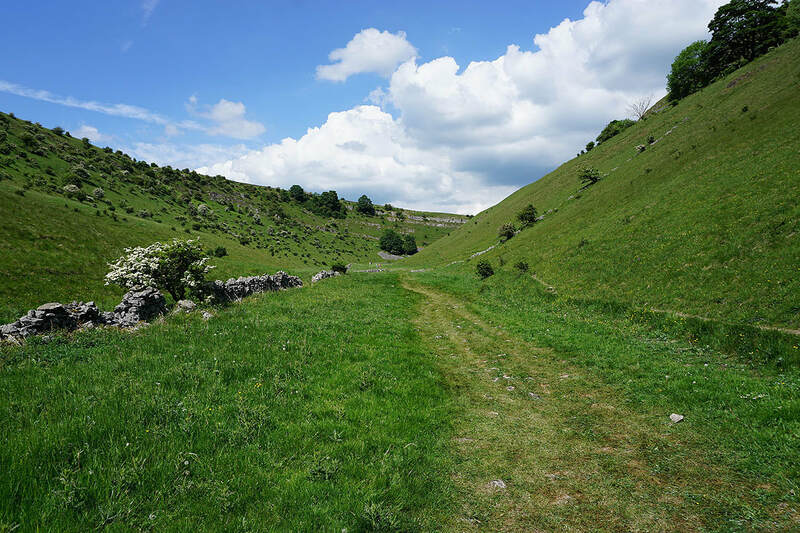 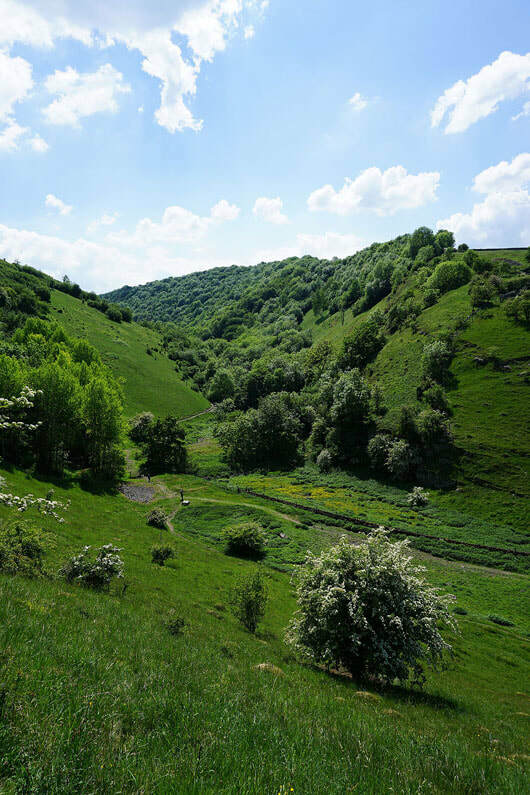 When I reached the top of Cressbrook Dale I followed the valley path south until just past where Tansley Dale joins Cressbrook Dale where I took the path up the side of the valley. 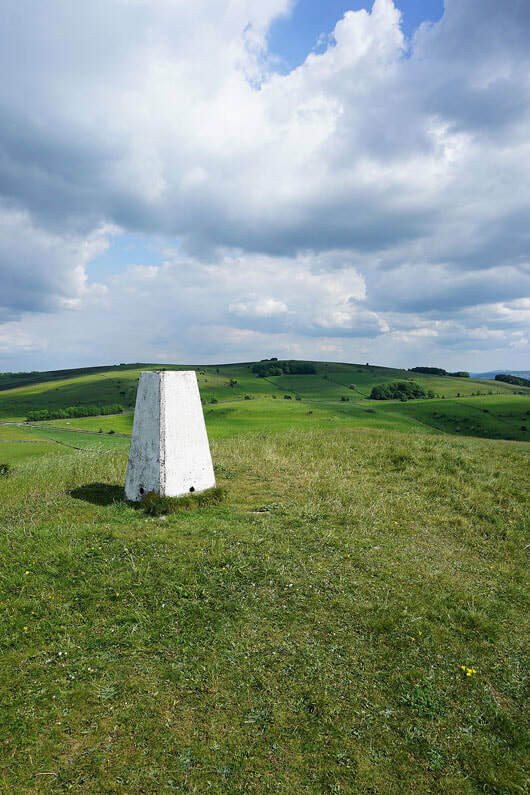 At its top I used access land to do a there and back visit to the trig point on Wardlow Hay Cop. 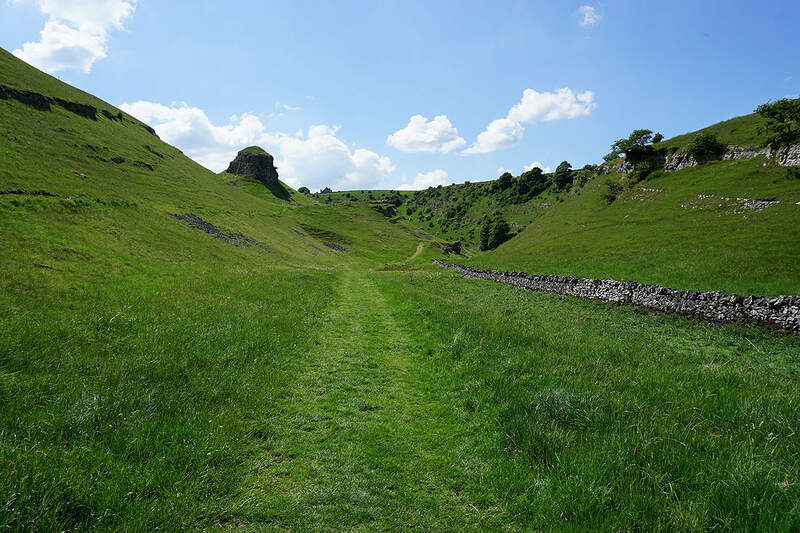 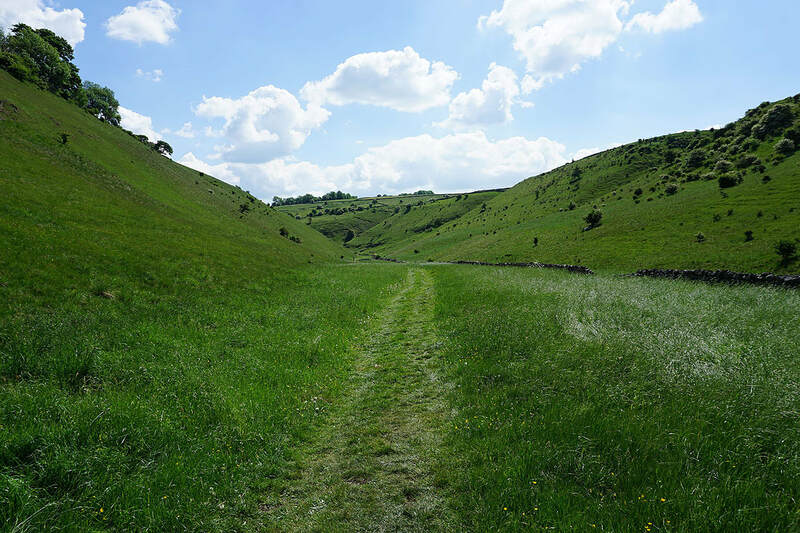 Having retraced my steps I followed the path down Cressbrook Dale to Ravensdale Cottages. 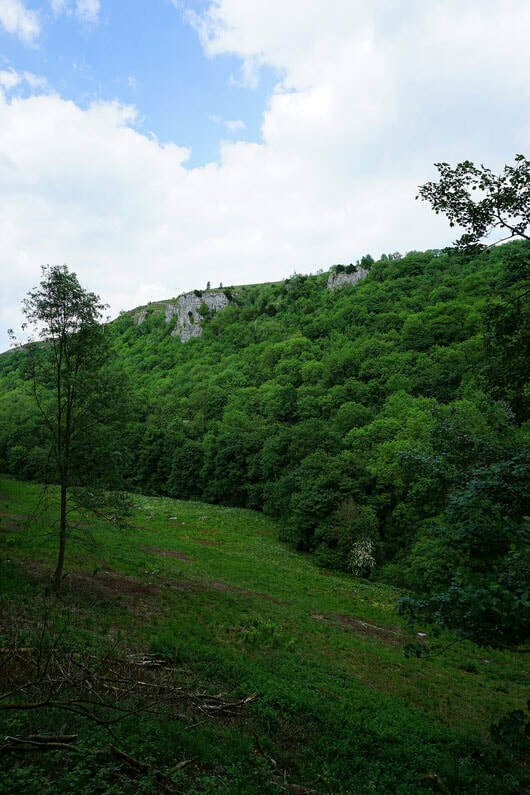 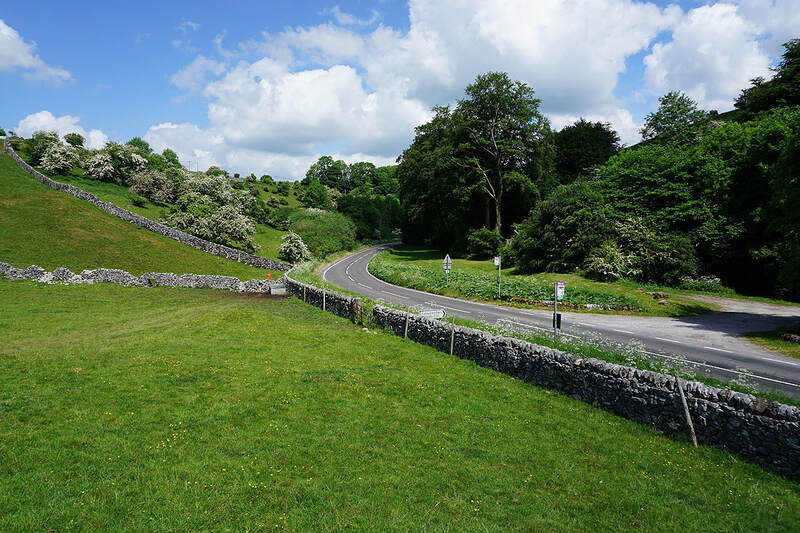 I then had a walk along the road to reach Cressbrook. 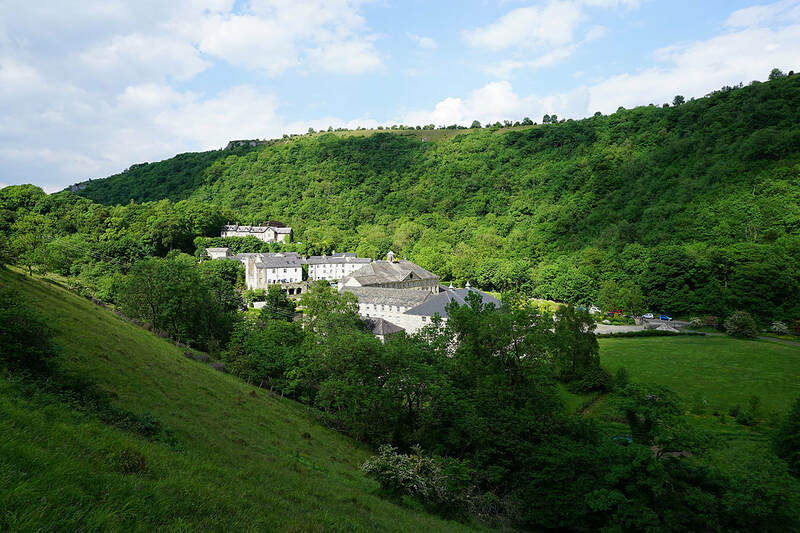 The concessionary footpath at Cressbrook Mill was used to cross the River Wye and join the Monsal Trail, which took me back to where I was parked at Monsal Head. 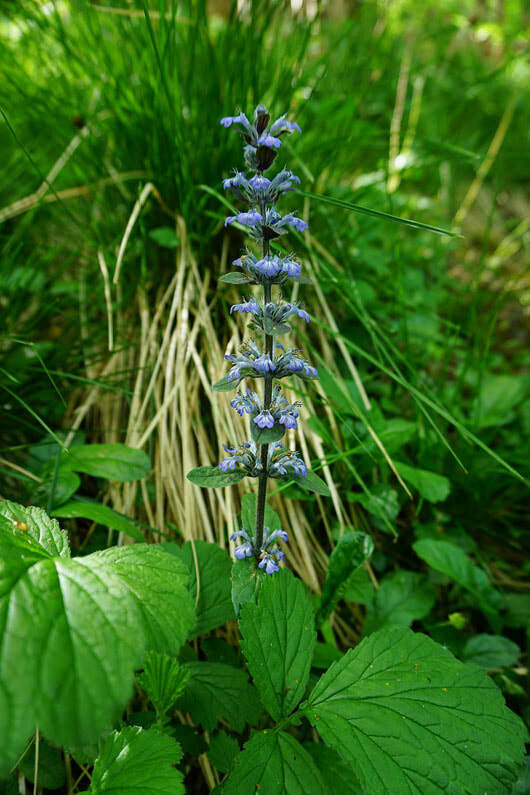 Bugle. 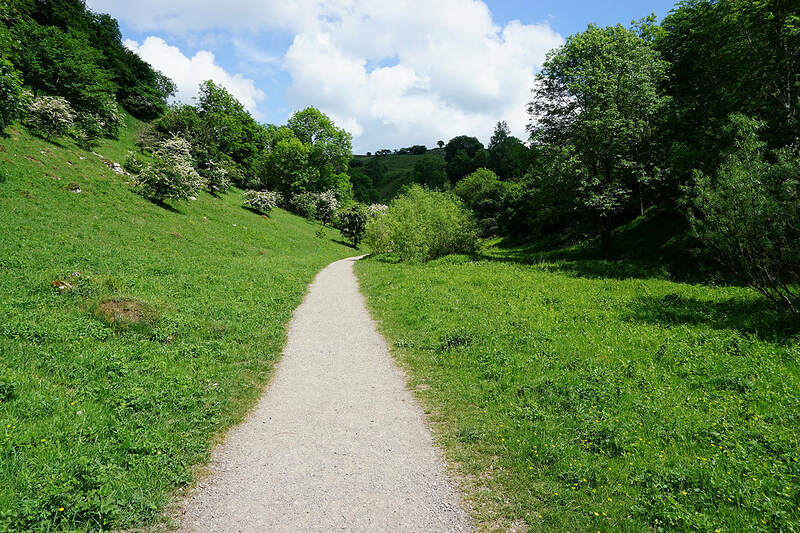 In the woods by the path down into Monsal Dale. 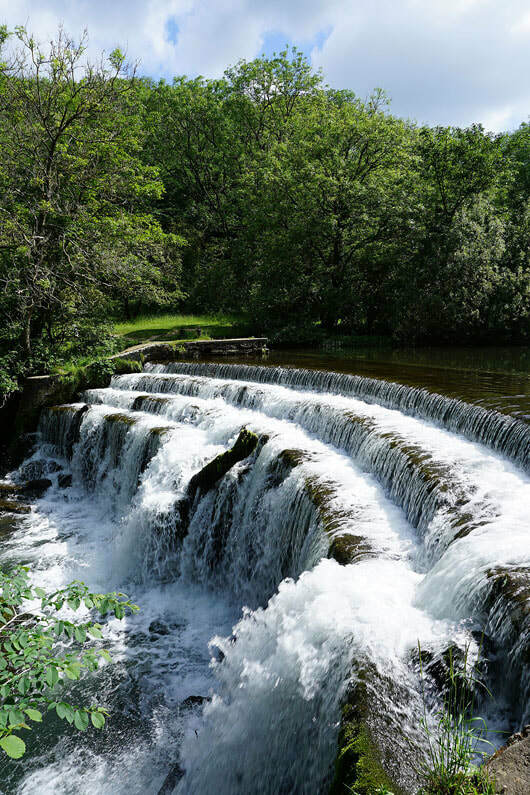 The weir on the River Wye in Monsal Dale..
Tideswell Dale in front of me as.. 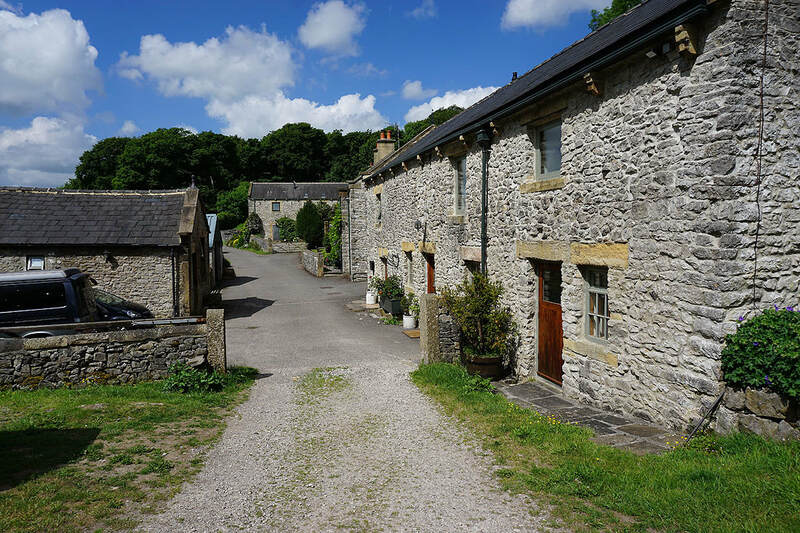 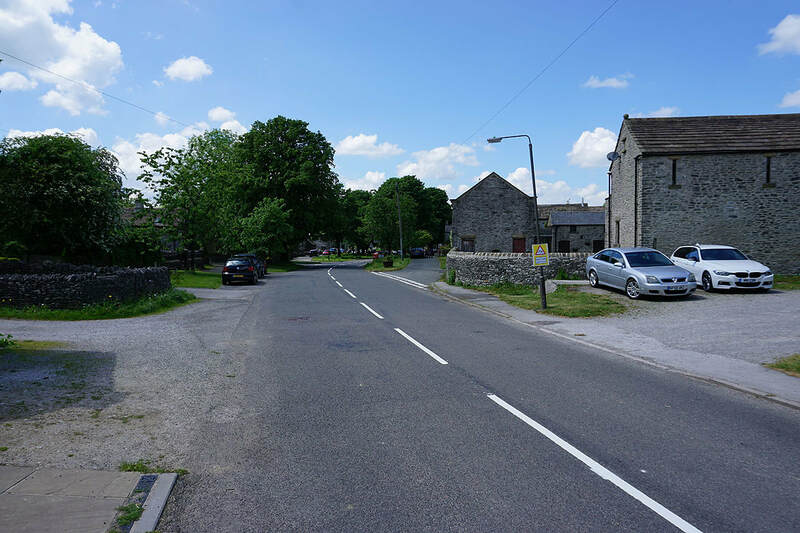 The village of Litton. 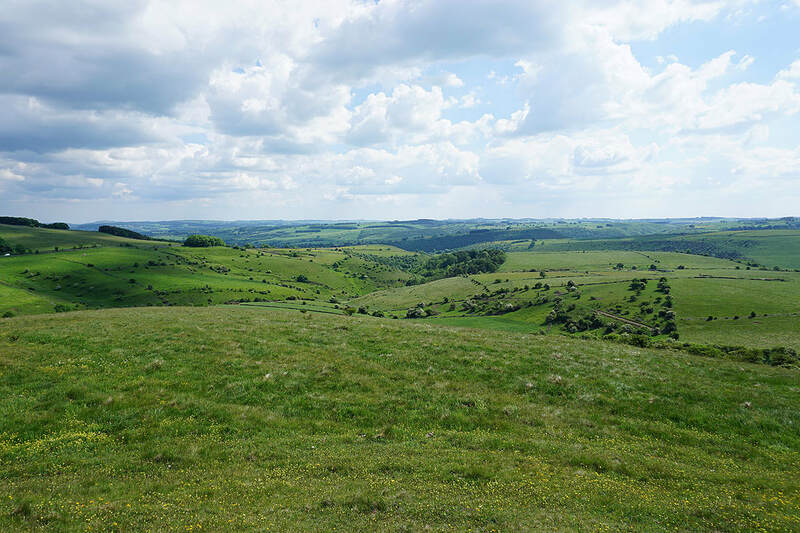 I stopped here for coffee and cake at the local shop. 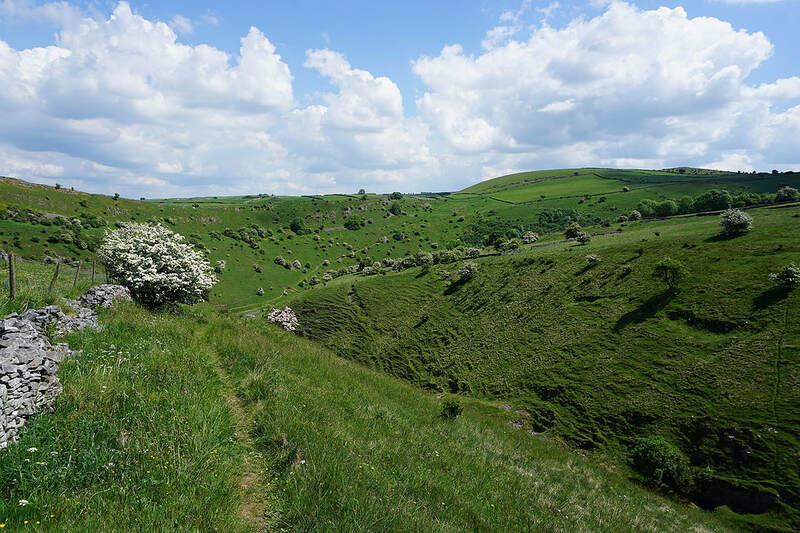 Peter's Stone on the other side of Cressbrook Dale.. 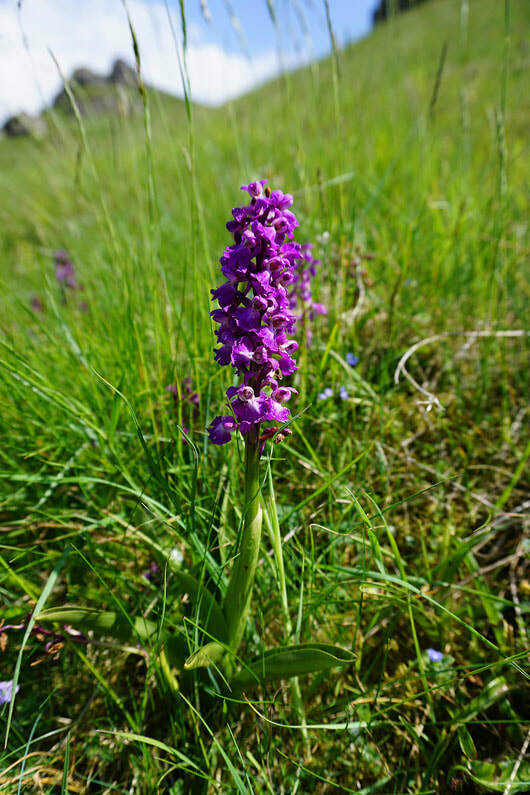 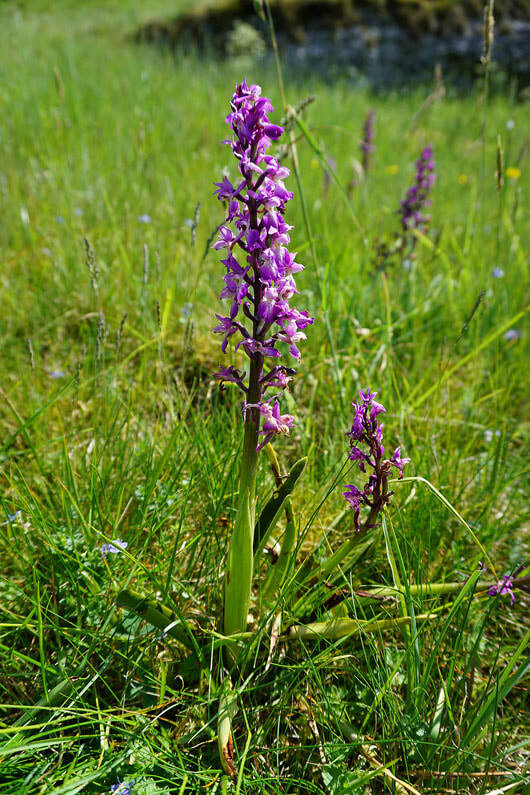 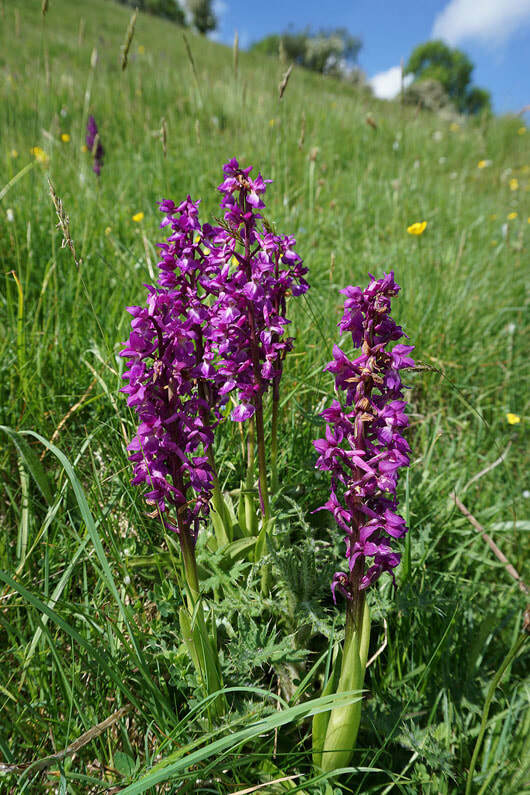 Early purple orchids. 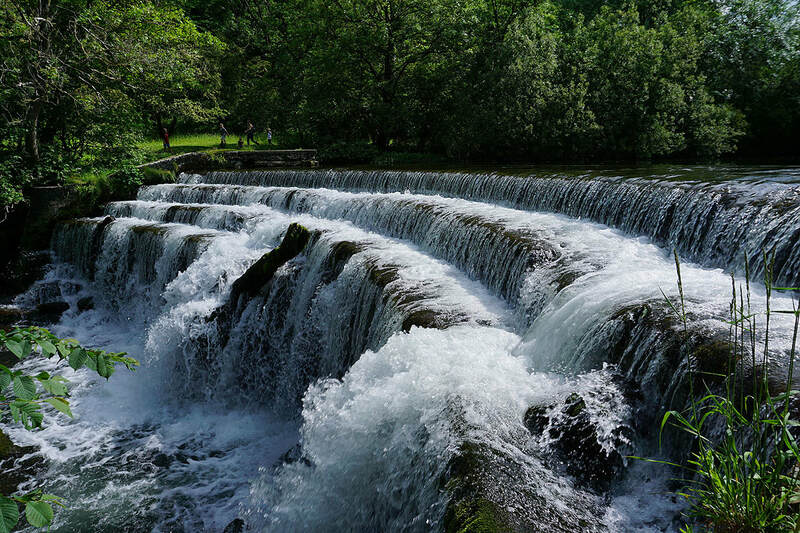 Most of them were past their best. 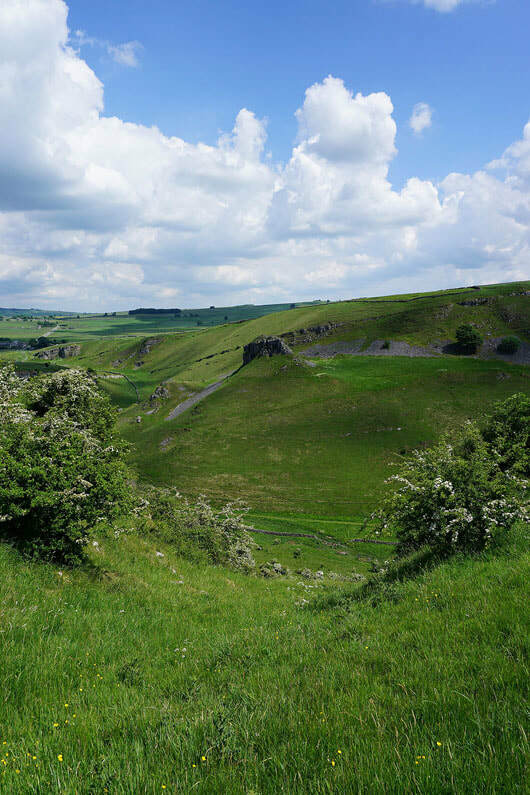 The view to the west and northwest to Litton and Hucklow Edge as I head up to the top of Wardlow Hay Cop.. 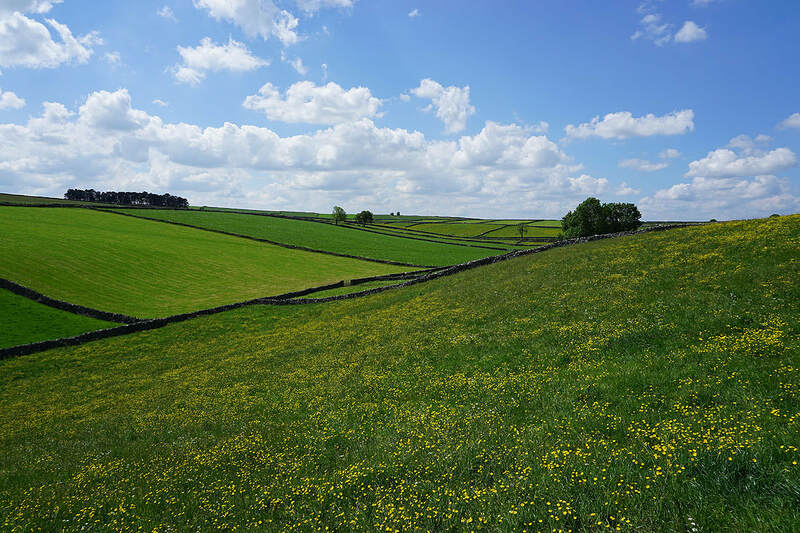 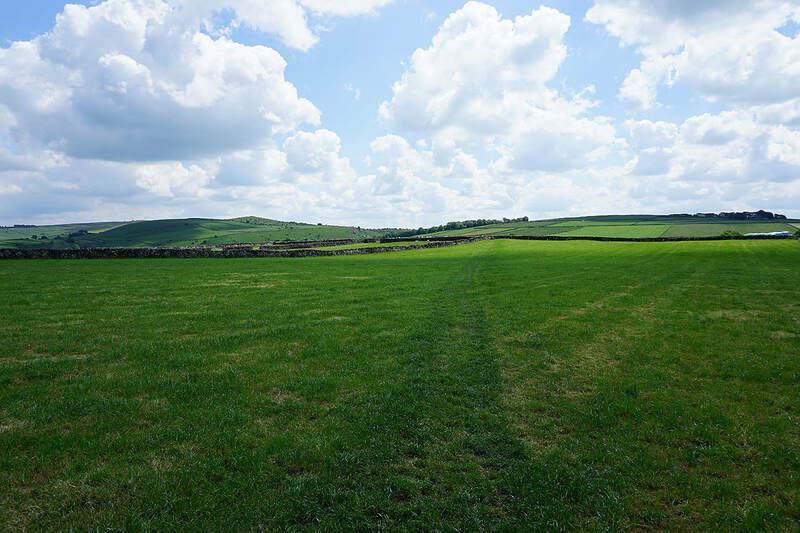 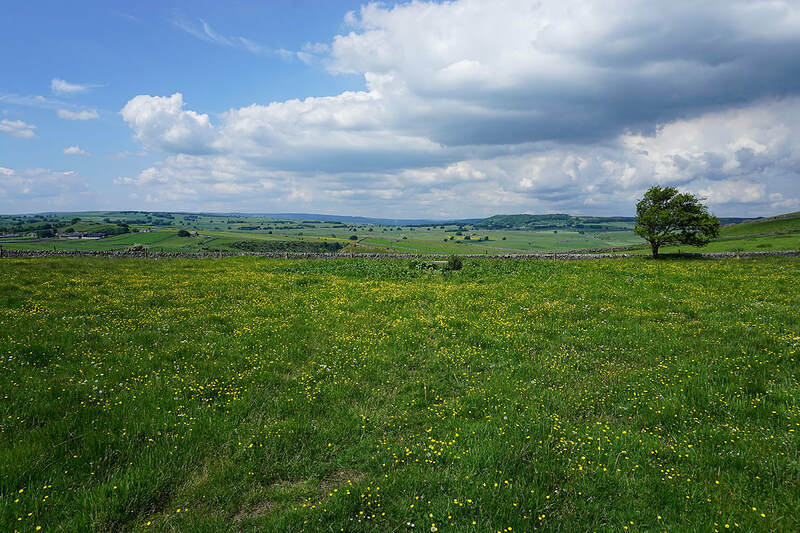 The view from Wardlow Hay Cop. 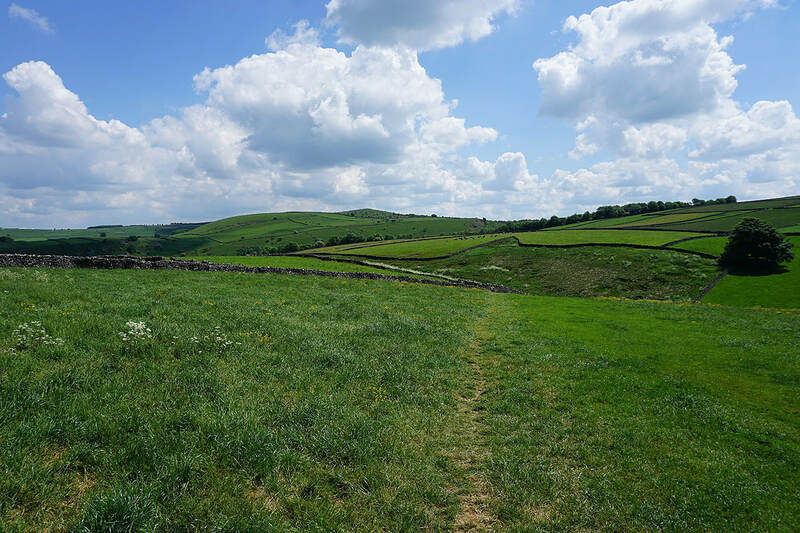 KInder Scout way in the distance with Hucklow Edge on the right.